The series was simultaneously re-released on a set of three double-pack VHS PAL videos, also available in a combined six-tape box-set. Reviewing the release for Ultimate DVD David Richardson declared the show: “A sobering, unsensationalized ‘70s drama... intelligent storytelling is complemented by powerful performances... Still relevant almost three decades on” (Issue 48, 2003). 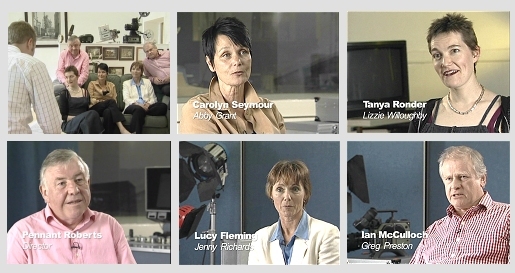 Screen-captures from the special features section of the series one Survivors DVD set, featuring Carolyn Seymour (Abby Grant), Tanya Ronder (Lizzie Willoughby), Pennant Roberts (director), Lucy Fleming (Jenny Richards) and Ian McCulloch (Greg Preston). 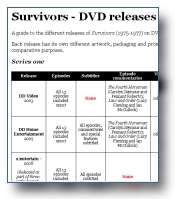 Related pages on this site: Series one press advertisements; Series one DVD studio day photo gallery. How do the different DVD releases compare?